These 30 Watt LED Drivers are suitable for nearly all our LED Lights we carry in stock. They are suitable for out LED Profiles, LED Downlights, LED Undercabinet Lighting and many other types of LED Lighting we stock. The electronic LED control gear is designed and manufactured with high performance? 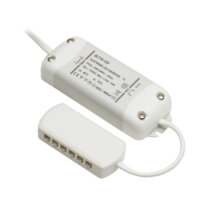 and multi protection functions; the long time short circuit protection, long time over heat protection. The control gear will restart autmatically after the fault conditions removal, so the user can select and use it very freely. Can the LED driver be connected to a standard domestic lighting circuit and controlled by a light switch? what type of plugs does this driver take, e.g. can I connect an led strip light to it and do I need to buy a separate plug? Hi Will this driver work with a loading of 6 lights of 3 watts, ie a load of 18watts? Yes that loading configuration will work fine.